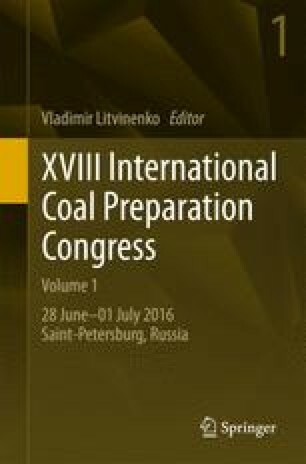 This paper presents the research on the sedimentation process of coal suspension. The main purpose of the research presented in this article is to investigate and understand the intensification of the sedimentation process of a coal suspension. It summarizes the impact of particular techniques for intensifying the sedimentation process, shows the possibility and high efficiency of the use of intensification techniques of sedimentation process: multiflux fillings conjugated with the process of flocculation. The paper presents an influence of concentration of the coal suspension on degree of compression, velocity of intensification process, and basically on the effectiveness of the sedimentation process. The experiments were done in the static measurements laboratory stand equipped in mechanical system controlling a digital camera that registers the sedimentation process, and in software analyzing the image in order to plot sedimentation curves. Experiments were done for two set ups of measuring cylinder: vertical and inclined, imitating (simulating) respectively the conventional sedimentation process and the multiflux sedimentation. Performed measurements indicate the possibility and justification of using the multiflux package together with flocculation process.